Well, my training this week hasn't gone as well as I wanted it to. Sunday, I had a 12 mile run scheduled. I went back to the Harpeth River Greenway and ran the entire section without any deviations to the alternate trail heads. I like parking at the Warner Park Nature Center because they have a bathroom there. Great for pre and post run necessities. My run started in the 50s and it was 60 or so by time I got done. I wore one of my Skirt Sport Happy Girl skirts (I have several; they make me happy!) and my race shirt from the 2015 Franklin Classic where I ran the 10k followed by the 5k. I call it a 10+5k since it's running 2 separate events one right after the other. I take about 1:15:00 to run the 10k, so I don't get much of a break before the 5k, especially since I tend to run back to my truck between races to switch racing bibs. Anyway, that shirt is a short sleeve athletic shirt. I wore my Paradigm 1.5s again. I know, I said they don't work for over 12 miles and maybe they still don't, but I really want them to work. I'm stubborn. I switched out the Lock Laces for a pair of regular laces I stole off another pair of Altras I have for non-running. Right away, I noticed the fit difference. I like my laces to be snug over the forefoot, barely there over the mid-foot and medium tightness at the ankle. It's hard to do that with Lock Laces. 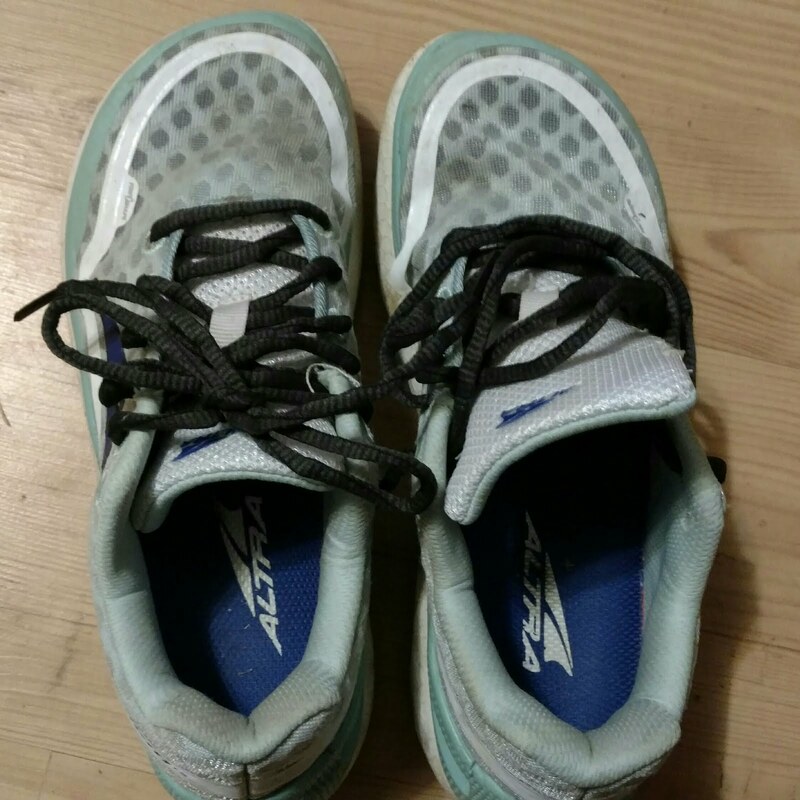 I was able to run much more comfortably with the laces this way. I managed the entire run with no blood blisters. Yay. I think I might try the Paradigms one more time with the laces in a lace lock position to pull them back against my ankle a bit more. The biggest issue I have with these Paradigms is I tend to get blisters on the inside edge of my forefoot; the bunion area, and these shoes make that worse. Does anybody else struggle with blisters at that point? Or is it just me? Share if you have tips! I ran 12.5 miles using a run/walk of 3:1.5. Took me 2 hours and 45 minutes for an average pace of 13:12/mile. Around 11.5 miles, my left hip started bothering me a little, but a little stretching during my cool down brought it right. But I didn't have any trouble with my IT band. I've been doing some glute strengthening exercises and I think that's doing the trick on the IT band. Need to be a bit more consistent about my strength training though. I hate weight work, so it's hard to get motivated, but hard to argue with results. During - 8 Honey Stinger (Fruit Punch) & 5 Cherry Shot Bloks (with caffeine) - alternated stingers/bloks; every 15 min. 1 blok, next time 2 stingers, repeat. This ended up being 66 carbs or 24 carbs/hr. Much better than the 1/2 where I only took in 40 carbs during the entire run. This wasn't quite as regimented as it should have been. I was using my Garmin watch to tell me to eat and when to run/walk, and some of the eat alarms were hidden behind the run/walk alarms. I did figure that out and still ate, but might have missed 1 or 2 opportunities to eat after all said and done. Note to self, make sure the eat alarm is slightly off cycle from the run/walk alarms. Post - 1 full Nuun tablet in 16.9 oz water; 1 oz quaker rice crisps (eh), handful banana chips (not going to work). At home - 2 cups black bean soup & 8 ritz crackers. Feel like this was almost adequate for during, but need better post run fuel, especially on the drive home. Going to have to continue to think about that. Suggestions are welcome in the comments!! What do you eat on the drive home from a long run? So here is where I have been struggling. A couple weeks ago, I had a fun training run where I pushed my speed a little during a treadmill workout. I did a 2 minute run/2 minute walk workout, but pushed my pace to 10:00/mile for the run sessions. That was a 6 mile workout total, so 50% at a 10:00/mile pace. I generally stay more in the 13:00 - 11:30 pace when I run. I'm not quite 5 feet tall with legs so short when I have my riding tights customized for length, they come back with notes to the seamstress, that "the customer really did say that short; it's not a mistake." And I'm a distance girl, not a speed demon. So 10:00/mile was quite fun for me and easier to control on the treadmill. Right after that workout, I went out to do errands and stopped by Starbucks to indulge in a Peppermint Mocha. I do not drink a lot of coffee or caffeinated soda (max 1 a day; more like 3-4 a week) and that shot of a ton of caffeine and sugar, combined with my workout gave me a rush that disrupted my breathing. I kid you not. I have been battling my breathing ever since, including during my long run this week. The issue is I feel like I need to take deep breaths several times an hour, but can't. I have to struggle for that deep breath. For some reason, I have taken to breathing shallowly and not through the diaphragm. So I skipped my speed workout this week and opted to focus on breathing instead. I've been focusing on breathing correctly throughout the day and forcing myself to breathe through my nose and breathe calmly. My next long run is likely going to be postponed for a few days while I do some shorter runs to try to work through this. I walked for 1.5 miles and felt that things were going pretty well. So I may end up walking more during my workouts for the next bit as well. I want to nip this in the bud, not let it get into something that will completely derail my training. In the meantime, I've cut out all caffeine except for what's in my Shot Bloks which I only use for long runs. Has anybody else experienced these types of symptoms? I'd love to hear stories, solutions, suggestions.